Miniature roses are nothing new but they do represent a rather unique opportunity for some growers to experience the joy of rose growing, even if their garden space isn't as big as they would like. Miniature roses are exactly what you would expect them to be, smaller versions of some of the world's most famous roses. They come in a wide range of colors and sizes and it won't take a lot of digging around before you find out that will suit your tastes. What makes miniature roses so great is their compact size lends them well to just about any location around your home or garden. Especially places where traditional roses would never work out. Climbing miniature roses tend to only grow about 5 feet tall, give or take, so unlike their larger cousins that sometimes grow 12 to 30 feet tall depending on variety, you can see how the planting needs change dramatically. For the most part you will be planting your miniature roses the same way you would any other rose, and we will cover those steps in the next sections. Choosing the right location for your miniature roses is going to be the most important decision you make in the life of the plant. The wrong location may not spell disaster, however it will determine how well the plant grows and performs. Most importantly is how much sunlight the location gets. Roses in general expend a lot of energy on their blooms and sunlight is one of the components they need to make this happen. If you are hopeful for profuse blooming, then you need a minimum of 6 to 8 hours a day of direct sunlight. 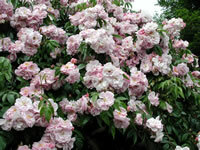 Airflow is an important factor in choosing the right location for your climbing miniature roses also. If the location is too sheltered, you may find that your roses never fully dry out after a rainstorm or between waterings, and this can lead to a lot of problems with diseases and certain pests. So the proper location will help you out tremendously and save you quite a bit of frustration down the line. I'm not suggesting you get fanatical about where you place your roses, just pay attention to the environment and put a bit of thought into it before digging a hole. 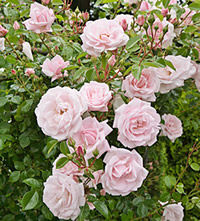 One good thing about planting miniature roses is you need a lot less space than traditional roses, so this opens up a few possibilities that you just couldn't consider otherwise. Pots and planters become an option at this point, even for the climbing miniature roses. There are actually quite a few trellises and supports that are made just for this purpose, so look around your local garden center and you are sure to find some options. While you're out there, pick up a bag of organic compost, to mix in with the soil you plan on using. 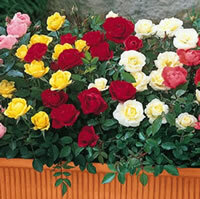 If you purchased your miniature roses in a container, then planting is pretty straight forward. Dig the hole a few inches bigger than the container and make sure it's deep enough so that the top of the soil in the container is level with the top of the hole. If you received your rose as a bareroot, then you need to dig the hole big enough to allow the roots to fully extend outward without forcing them to fit the hole. Mix your soil 2 to 1 with the organic compost and use that mix to backfill the hole after setting your plants. Ok so now you've got your miniature roses planted and it's time to give them everything they need to grow big and strong. The first consideration is the watering schedule. 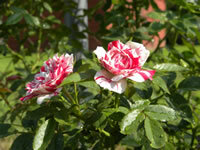 As a rule of thumb, you want to give your roses one good watering every week or so. Keep in mind that if you live in a hot and arid climate, you may have to speed that up to every 4 to 5 days. The most important thing is to not over water them. Stick your finger into the dirt to see how far down the moisture goes. If your finger comes out wet, they don't need watered. Remember that most potting soils hold water pretty good, so keep a close eye on this. Fertilizing your climbing miniature roses is pretty standard as well. Just about all roses get their first feeding at the start of spring when the leaves start to pop. Now from there you can let them go all season if you like, however many growers use a 3 time a year feeding schedule. The 2nd would be usually around the first big bloom, and the 3rd generally is given around the middle of July. Very important, make sure you leave at least 4 weeks between feeding and stick with an all-purpose granular fertilizer. Too many of the chemical liquid fertilizers will burn many varieties of roses. Pruning miniature roses is actually a snap and I've found them to be far more enjoyable than the full-size roses because usually they're very easy to reach. Start off by removing all the dead wood and any canes that look like they might be diseased. This is also a good time to gather up the dead leaves and sticks from the base of the plant. Do not let them lay there, it's an invitation for pests and diseases. Pruning serves two purposes, the first is to open up the center of the plant a bit and the other is for shape. You want to prune back to an outward facing bud as this encourages it to grow in that direction. This is a good method for training your miniature roses around supports. It's also advisable to try and keep canes from overlapping as this usually creates competition among the leaves for sunlight later in the season. I've also learned not to get too crazy pruning my climbing roses. Remove too much in a single season and you might shock the plant and it could take several seasons to recover. Take it down in small steps until you get them where you want them.